Home / Uncategories / This smart watch turns your skin into a touch screen! One of the biggest challenges with smartwatches is trying to navigate through apps on a relatively tiny screen. While smartphones and tablets have gotten bigger over the years, the gadgets we wear on our wrists need to stay small to avoid looking terribly unfashionable. 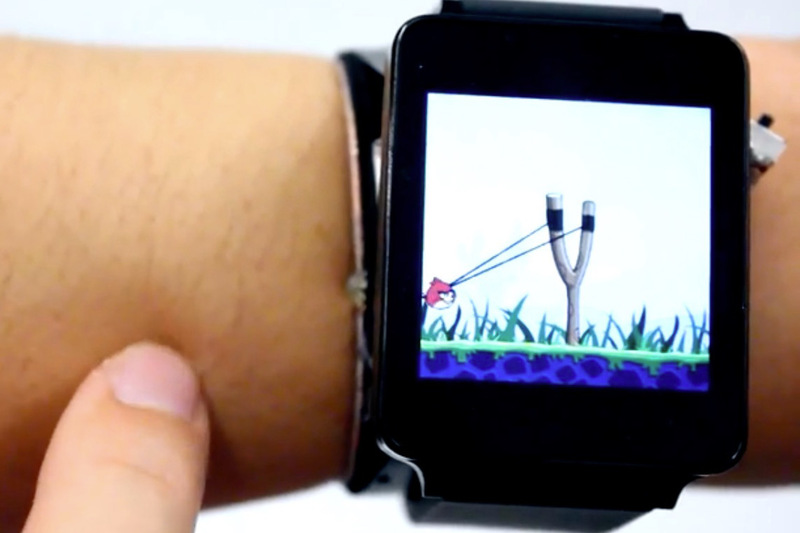 Today a team at the Future Interfaces Group, a research lab within Carnegie Mellon University, released a look at a novel solution to this problem: making the skin on your arm and hand act like a touchscreen for your smartwatch. The system uses a signal-emitting ring worn on the finger to communicate with a sensing band attached to the watch. When the finger wearing the ring touches the skin, a high-frequency electrical signal spreads across your arm. It uses the distance between the ring and four pairs of electrodes in the watchband to triangulate the position of your finger in 2D space. "The great thing about SkinTrack is that it’s not obtrusive; watches and rings are items that people already wear every day," said Yang Zhang, a first-year Ph.D. student at CMU who worked on the technology. The system can sense continuous tracking, allowing you to doodle a picture for example. It can also sense discrete gestures like swipes or taps. The prototype built by the group as a proof of concept showed off a lot of interesting interactions. You can swipe up and down on your wrist to move between apps, then left or right to enter and exit a program. That is neat, but it basically just replicates what's available already through your smartwatch screen. The really cool stuff happens when you start using your skin as a canvas. You can drag apps off the watch and place them on parts of your arm, creating shortcuts back to the app. Put your Twitter app on your elbow, for example, and you can quickly access it with a tap on that spot from the finger wearing the ring. Adding all that new real estate as part of your touchscreen also opens up possibilities for the watch as a gaming device, for example a long pull on the slingshot in Angry Birds. The watch can also recognize hot key commands. Trace an "N" on your hand to open up your news app, for example, or an "S" to silence a phone call. Skin and screen can also be used to indicate different modes, with a screen swipe performing a slow scroll through an address book, and a skin swipe activating a rapid scroll. There are still some kinks to work out. According to the lab, "keeping the ring powered up is a challenge. Signals also tend to change as the device is worn for long periods, thanks to factors such as sweat and hydration and the fact the body is in constant motion." They do stress, however, that despite the way it sounds, " The technology is safe. No evidence suggests that the radio frequency signals used by SkinTrack have any health effects. The body is commonly excited by daily appliances — everything from the tiny amounts of current drawn from the finger by touchscreens to the electromagnetic noise emanating from fluorescent lights — with no ill effects." For now there are no concrete plans to commercialize this technology, but given the heavy emphasis many tech giants have placed on the smartwatch category, this technology seems like a promising avenue for improving the usability of wearable devices without compromising style or battery life. Google even showed off a similar idea last year, a touch-sensitive fabric that would allow gesture control through clothes. Equally interesting are all the subtle new forms of etiquette that might develop if this tech was commonplace. Was I scratching my hand or replying to a text message? Dinner dates will never be the same.